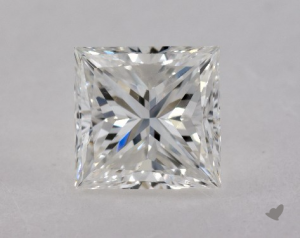 Searching for princess cut diamonds using these criteria will enrich your results for diamonds that have been cut to maximize light performance rather than carat weight. These proportions are associated with moderately high crown heights, which produce more fire. You will still need to visually check each candidate because GIA does not provide crown height measurements on their certificates. AGS is the only grading lab that assigns a cut grade to princess diamonds. They have published proportion-based cut grade criteria based on their scientific study of the optical properties of diamonds. Unfortunately, GIA does not provide the detailed measurements needed to take advantage of AGS’s criteria for princess diamonds, so we can’t implement a cut estimator for princesses like we’ve done for round diamonds. GIA provides table and depth % for princess diamonds. We can use it as a rough proxy for the other measurements to screen candidates and then rely on our eyes to select a beautiful stone. Learning by example is the easiest way to understand what makes for a good princess cut. James Allen True Hearts princess cuts are all AGS 0 Ideal diamonds. 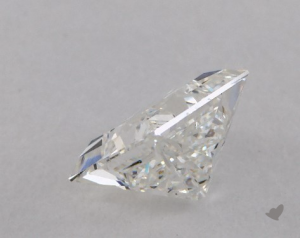 These diamonds serve as positive examples of what AGS considers to be well-proportioned stones with the best light performance. They all have a similar look with a moderately high crown and smaller table. 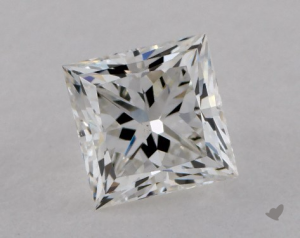 After you’ve recognized this visual pattern, you can apply it to find other well-cut princess cuts from GIA and save money by avoiding the marketing premium associated with True Hearts or other similar branding. We downloaded the proportions data for these AGS 0 Ideal princess cut diamonds and created a heatmap showing the frequency of table %, depth %, and crown height. In the figure below, brighter blue indicates more diamonds with each combination of proportions. Points are individual diamonds contributing to the heatmap; their color corresponds to their crown height. We also plotted a histogram showing the overall distribution of their crown heights. 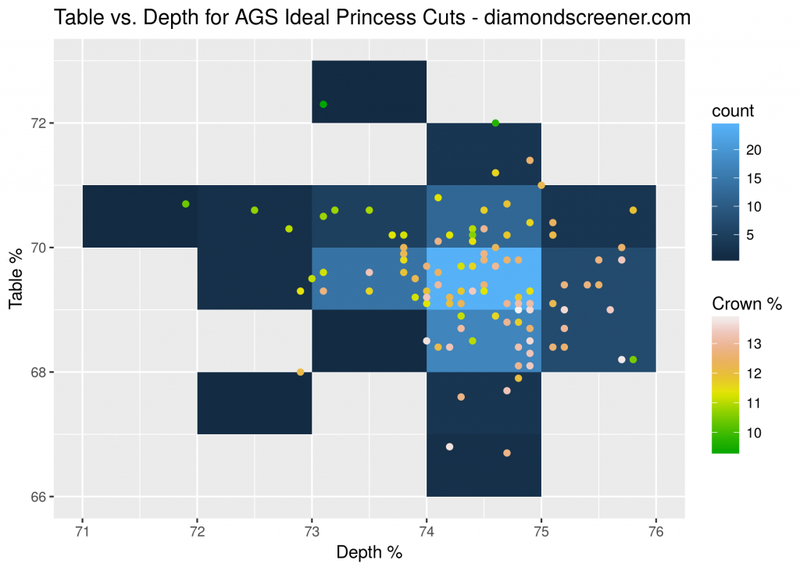 The range of AGS 0 Ideal princesses in this sample is 71-76% depth and 66-72% table. The highest concentration of AGS 0 Ideal princesses are 74-75% depth and 69-70% table. We’ve reduced the range to 71-75% depth and 68-72% table. In practice, depth > 75% and high crown heights for diamonds with table < 68% sacrifice too much spread (the diamond will have smaller than average side lengths in mm). 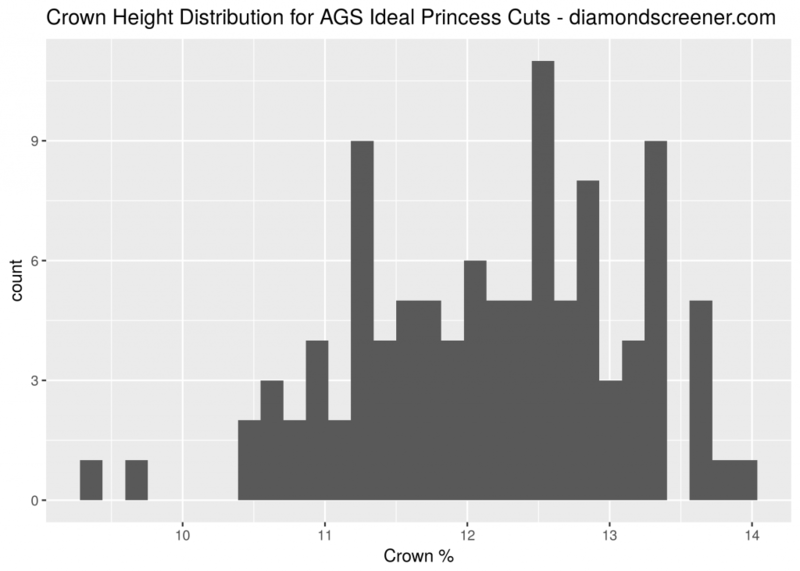 AGS 0 Ideal princesses all have moderately high crown heights (10.5-14%). A moderately high crown height implies that a diamond has been cut to maximize light performance rather than carat weight. Moderately high crown heights are associated with smaller tables; worse cut stones will have crown heights outside of the range shown in the graph. An octahedron of diamond rough can yield two princess stones. 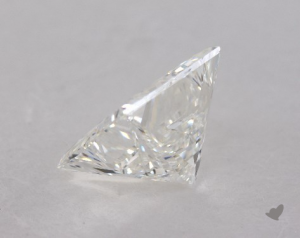 They can be cut to maximize carat weight or to maximize light performance. If they’re cut to maximize carats, then they will have flatter tops and larger tables. If they’re cut to maximize light performance, then material is sacrificed to produce a higher crown height and a smaller table (see images below). A moderately high crown provides more opportunity for light to refract and produce fire. Since a diamond’s purpose is to be as shiny and fiery as possible, light performance is preferable to carat weight. 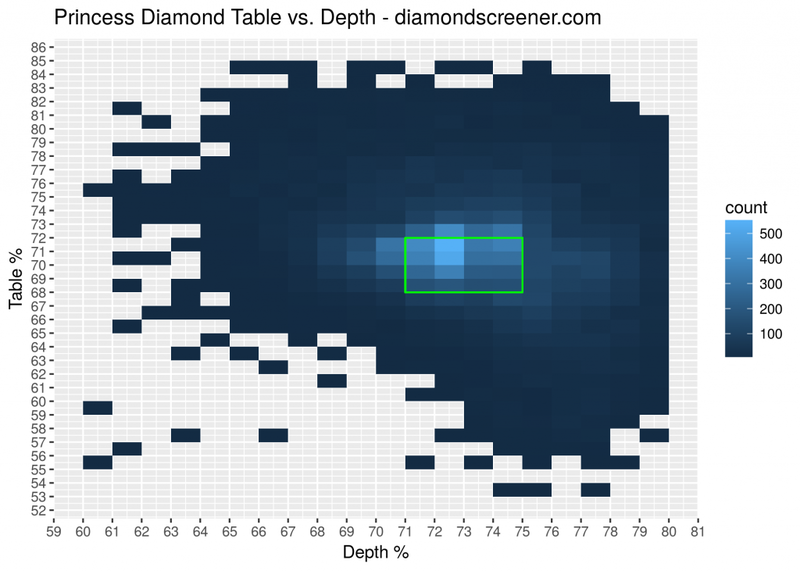 How do our recommended depth and table proportions compare to available princess diamonds? We plotted the proportions data for all princess diamonds in our database from James Allen and Blue Nile in the figure below. Our recommended depth 71-75% and table 68-72% are outlined by the green box. Diamond cutters seem to target these proportions because the highest concentration of diamonds is contained within the green box. This suggests cutters recognize these proportions produce the best optics. However, cutters show a shift towards a lower depth and bigger table within this range, balancing light performance with increased yield. Based on this analysis depth 71-75% and table 68-72% with table % ≤ depth % will enrich the results for the best-performance stones when crown height measurements are not available.